Nguyen Phan Chanh was recognized to make substantial contributions to Vietnamese silk paintings in the early 20th century throughout the history of Vietnamese Fine Arts. He laid the foundation for Vietnamese silk paintings with a consistent style throughout his career path. Nguyen Phan Chanh was simple, optimistic and always worked hard during his lifetime. 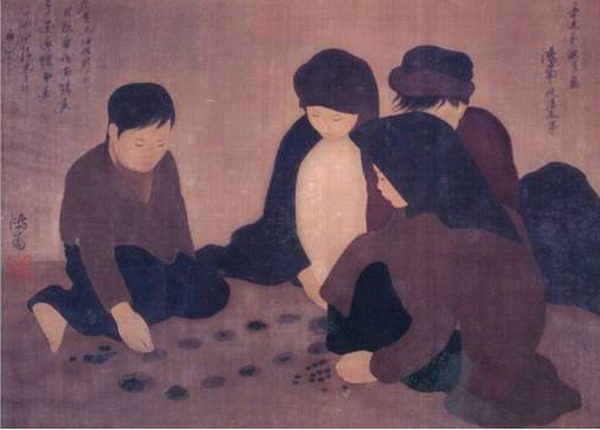 Due to his talent for painting, he could not only relax himself but earn a living as well. He left next generations a wide range of silk paintings imbued with national spirit. When he studied Chinese and National Language in his homeland, he was familiar with Eastern fine arts through conventional poetics in Chinese. In Hue, he had a chance to gain access to the art through mausoleums, capitals, frescoes, paintings of Vietnam’ landscapes including Red mountain and Lam river in his hometown. At the age of 30 (1922), Nguyen Phan Chanh graduated from Hue National School and then he taught at Dong Ba primary school. 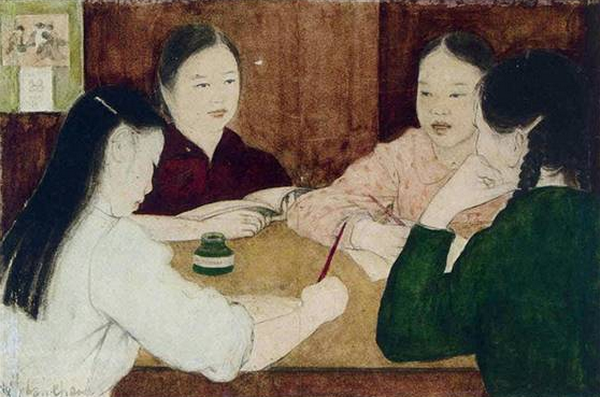 In 1925, he was encouraged to take the entrance exam for the Indochina Fine Arts College (Hanoi) by his friends. He was the only candidate from Central Vietnam to make a strong impression on French judges among nearly 100 candidates. Principal Victor Tardieu motivated him to work on silk paintings and then his artworks became Vietnamese unique silk paintings that showed a striking difference compared to those of other countries. After 5 years of studying, he officially became one of 10 candidates recruited. With a good command of folk art and an intense passion for the art, he was inspired by Eastern art after gaining access to Chinese silk paintings and Japanese silk paintings. His silk paintings were of remarkable success from 1931 such as Mandarin Square Capturing, The girl feeding a bird, Wash vegetables by the pond. At that time, Nguyen Phan Chanh revealed his talent throughout the realism of his artworks depicting people’s life in the contemporary society. His first paintings displayed in Paris trade fair not only brought him the pride but significantly changed the French’s negative attitude towards Vietnamese visual art as well. Thanks to Nguyen Phan Chanh’s artworks, he enabled the artists over the world to take notice of Vietnamese silk paintings. After graduating from the college, although he was famous in foreign countries, he was positioned to teach at the fine arts chool in Indochina. Afterwards, he was replaced by another one who pleased the French authorities. 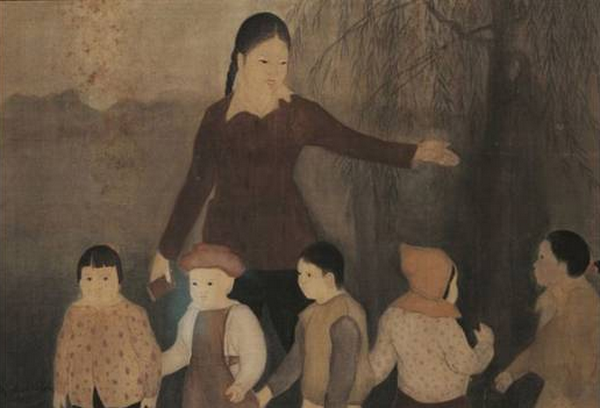 In 1938, he rented a room to hold his solo exhibition to say farewell to Hanoi before he returned to his homeland and continued painting simple farmers. It was not until 17 years after the restoration of peace in Northern Vietnam that Nguyen Phan Chanh returned to Hanoi at the age of 63 and continued working on silk paintings. After the August Revolution especially over the period between1955 and 1973, he executed a large number of silk paintings (58 silk paintings and many sketches) at the age from 60 to 80. His artworks represented Vietnamese silk painting for nearly half a century. Many exhibitions of his works were not only useful lessons for Vietnamese artists but Vietnamese fine arts’ exposure to the world. 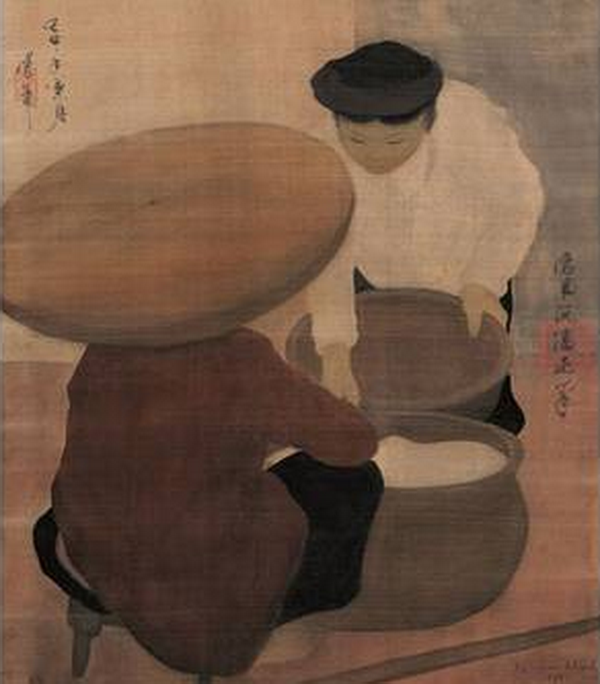 The dealer Pascal de Sarthe bought the painting “The Rice Seller” whose price reached a record high at an auction. Previously, painter Le Pho held the record for the most expensive painting (370,000 USD). It could be seen that Nguyen Phan Chanh’s paintings usually included the calligraphy as he learnt Chinese and calligraphy when he was a child. 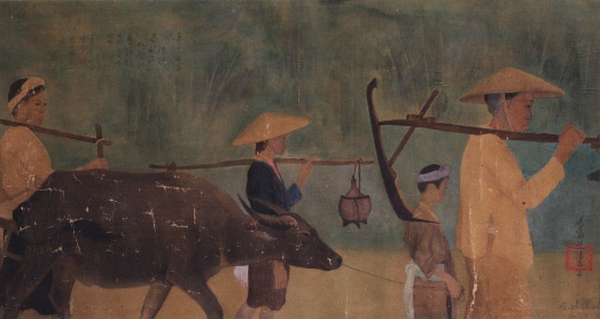 According to an article, “Nguyen Phan Chanh had a unique habit compared to other painters. Although he finished a painting, he had to add several lines of poetry (in Chinese) to convey his feelings. The poems could express the paintings’ content, but sometimes they were just his personal feelings without any relations to the paintings. It could be said that the poems on Nguyen Phan Chanh’ silk paintings drew a distinction compared to other ones. Thanks to this, his paintings were less likely to be copied”. 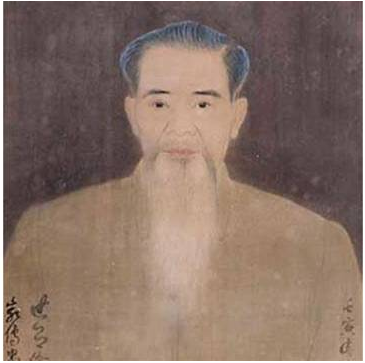 Nguyen Phan Chanh was the only painter to work on silk paintings until his death and created a unique style among the artists of the first class. 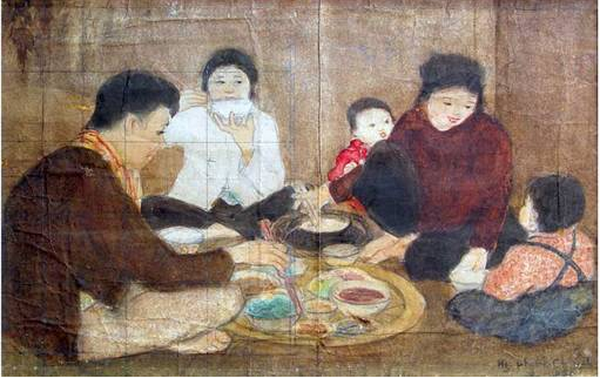 However, the painters in the Indochina Fine Arts College at that time (and later) no longer used natural colors. They used watercolors on the silk instead and after finishing a painting, they stuck the glue and the paper to the back of the silk. 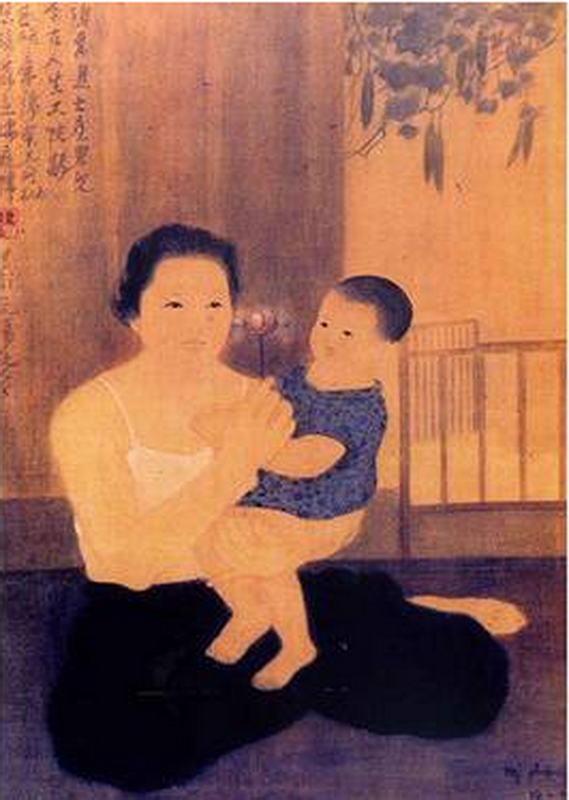 The basic techniques in traditional silk paintings were changed. When using natural colors, the painters did not wash or polish the silk too much. They usually painted once or his brushstrokes just glided over the surface of the silk. Besides, using watercolors was a dyeing technique. The watercolors would infiltrate into the silk and turned it into the colored one. This technique required the painters to wash the silk many times and paint when it was wet. The shimmering beauty and the rich shade expressed on the wet silk would be more cogent than those on the dry silk. However, when painting on the wet silk, different colors were dissolved that darkened the silk. 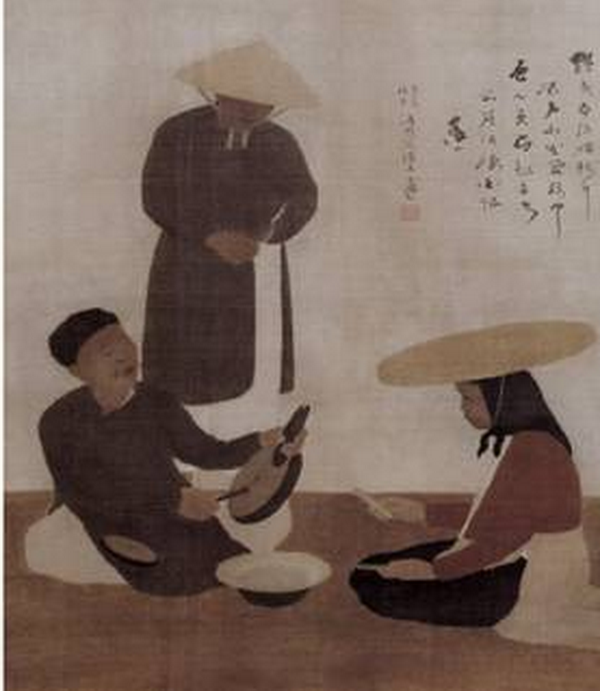 In actual fact, the contemporary silk paintings executed following this technique (painting on the wet silk) would get darker and darker. In addition, the silk paintings having the paper stuck would be damaged by time because the glue did not work anymore. Several silk paintings at the Vietnam Fine Arts Museum are likely to break into pieces after over 50 years. Many of Nguyen Phan Chanh’s paintings were destroyed by time. Three damaged paintings Young Girl Crosses River on Cow’s Back (1967), Fumigating the Boats and Cutting Wood (1938) were sent to Japan for restoration. When it came to the actual restoration, “the hardest task was to remove the layers of paper broken into pieces. I tried to collect the remnants of the paintings and reassemble them.” Mrs. Kikuko Iwai (Director of the Institute for Art Restoration) who was famous for the restoration of Picasso’ artworks said.